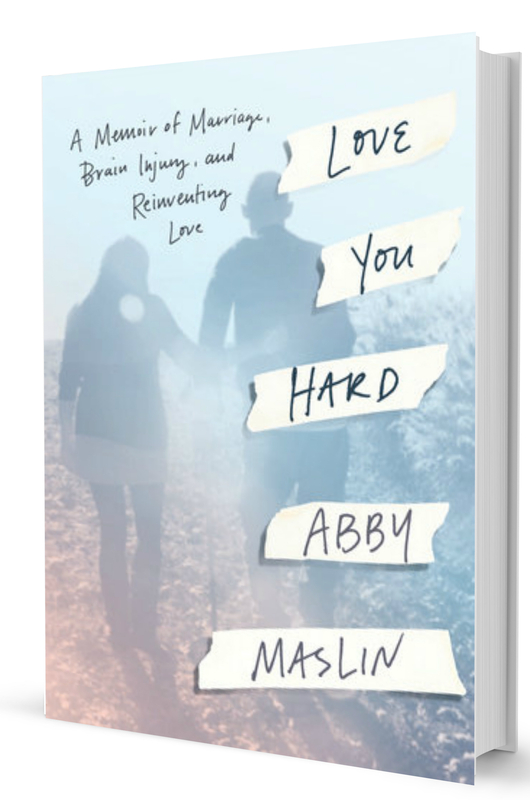 I’ve just finished reading Abby Maslin’s page-turner, Love You Hard, which is set to come on the market March 12, 2019. It’s a story about trauma, love, marriage, self-examination, discovery, and choosing love when love is hard. Abby has been blogging for BrainLine for years (see Reinventing our Family), about her experiences after her husband, TC, was assaulted and sustained a severe TBI. Her signature honesty, masterful writing, and personal insights have earned her a wide audience, but reading her book is another journey completely. It’s the full Monty, her whole story — the inner dialog of her fears and desires expressed in beautifully crafted prose and jolting revelations. Their lives could easily have been ruined, but they struggled together as their relationship evolved to absorb successive blows thrown at them individually and together — not in storybook form but through heartbreak, frustration, herculean effort, and resolving the petty arguments that masked the darker fears that Abby was not ready to face. Their young marriage was compressed with serious physical and emotional obstacles — the kind of obstacles most marriages only see over decades as spouses age together. Abby and her husband were forced to deal with several life-altering events in a short period of time: a random act of violence — an assault that cost TC his job, his ability to speak and express himself, and his identity; the declining health of parents; and the slow death of Abby’s father. As impact after impact hits, Abby wonders if withdrawing from love is the healthiest option of all. Going all in hurts too much. In cold plastic hospital chairs, in a beach cottage mastering techniques to treat her husband’s aphasia, and on the winding white roads and yoga mats of Santorini, Greece, Abby works out her grief and seeks answers to the defining question haunting her. This book packs a lot of wisdom — the introspective wisdom earned by the hard work of seeing ourselves as we really are, of figuring out what we value and why, and of making conscious decisions day by day that honor ourselves and the ones we love. Read it. Absorb it. You’ll learn about aphasia; you’ll understand ambiguous loss; you’ll follow Abby down dark hallways and into sunlit rooms and learn what it means to own a life built on raw truth. Abby says that sometimes we wish others could read our minds, but the only real option is to stay honest with the people in our lives. When my husband suffered a catastrophic brain injury at age 29, I rarely appreciated being told that God had a plan for us. I certainly didn’t want to be coached to keep my eye on the prize or to search for those silver linings. I wanted to cry out in pain and to sit in it for a moment. I simply wanted it to be what it was: hard. And I wanted that to be OK with everyone else too. “I’m sorry your life got ruined,” a well-meaning friend sympathized one day. Her words landed like bricks. Wait, I thought to myself, was she right? Was my life really ruined? Was I the last to know of my own obvious fate? What do readers in the brain injury world want? I can only guess that like me; they want it all: practical solutions, resources & references, a place to vent, a place to grieve, a place to interact with people who "get it." Abby Maslin shares an inspiring story of resilience and commitment in a deeply affecting new memoir. After her husband suffered a traumatic brain injury, the couple worked together as he recovered—and they learned to love again. When Abby Maslin's husband, TC, didn't make it home on August 18, 2012, she knew something was terribly wrong. Her fears were confirmed when she learned that her husband had been beaten by three men and left for dead mere blocks from home, all for his cell phone and debit card. The days and months that followed were a grueling test of faith. As TC recovered from a severe traumatic brain injury that left him unable to speak and walk, Abby faced the challenge of caring for—and loving—a husband who now resembled a stranger. Love You Hard is the raw, unflinchingly honest story of a young love left broken, and the resilience required to mend a life and remake a marriage. Told from the caregiver's perspective, this book is a daring exploration of true love: what it means to love beyond language, beyond abilities, and into the place that reveals who we really are. At the heart of Abby and TC's unique and captivating story are the universal truths that bind us all. This is a tale of living and loving wholeheartedly, learning to heal after profound grief, and choosing joy in the wake of tragedy.